Here is an easy way to open your Telegram account on PC or Desktop. This method can also be applied on your notebook. How to install telegram application will also be discussed here and how to login or synchronize your telegram account on different platforms. Telegram applications offer very strict user data security (privacy), and maybe that's one of the reasons why this app was blocked by Indonesian government temporary. Apart from that, this application is similar to other chat applications like whatsApp or BBM app on PlayStore, which can send messages, pictures, videos, files and also create groups. Used by community, activists and public figure. Secretly, this telegram application is used by various person, especially to create a group chat. Actually, one of the advantages of Telegram is the capacity of group (members) is very large, up to 20,000 members for one group! Very promising for business or activity with quantity orientation. Telegram uses a cloud computing system which means that all data sent and received is not stored on the user's smartphone (memory) locally, but is stored on their (telegram) server, this allows us to move around the gadget without afraid of missing files or posts (which you get on previous gadgets). Telegram claims that the synchronization process is done in a real time, by giving examples if we are typing on a Smartphone and then move to a computer, then we can still continue the text that we previously typed in Smartphone (different platforms). There will be two methods on How to open Telegram Account on your PC or Desktop, first is using browser and the second is using Telegram installation file (official). Here is the first method on How to open Telegram account on a PC or computer through a browser. In this first method we do not need to download the software or installation files. Here are the steps or tutorial. The website will send a verification code to the Smartphone with the same Telegram account, enter the code provided. Duration to enter the verification code is very short only 2 minutes. Make sure your phone is within your range when you login. Keep in mind that you are using a browser to operate Telegram so that when the browser is closed then Telegram applications will stop as well. 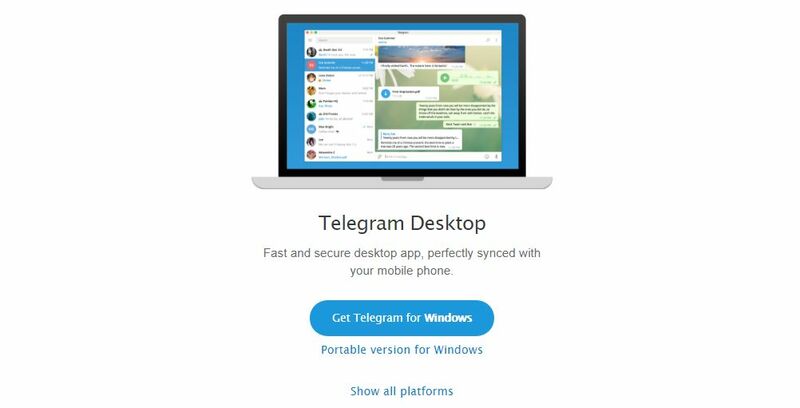 Download the installation file by clicking the blue button "Get Telegram for Windows" (If your computer uses OS Windows, or iOS if you are using an Apple (Mac). Install File. Double-click (or right-click >Run) on the downloaded file, then follow the instructions until the install is completed. As with opening a Telegram account on the website, in this method you are also required to verify the login, before it can fully operate the application. With this method the application does not depend on other applications such as the browser, so it will not interrupt your browsing activity and you will also avoid 'unintentionally closed the browser. Why use Telegram for Desktop (Computer)? In addition to the efficiency considerations for office workers, please note that Telegram application does not set the maximum file size or duration of video to be sent or received so it will be very useful if we are sending files with large size directly through the PC. With this method we can do work efficiency, because we are no longer busy with switching gadgets when we are chatting with many contacts in telegram. Hopefully this article could help you guys who are looking for tutorial on How to install or open Telegram account via computer or laptop. If you have a problem or something to asked, please put your question in the comment field below as usual. Stay wise! #beWiseUser!